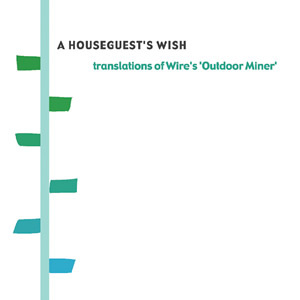 Nineteen artists from five countries contributed versions to Words On Music's 25th Anniversary tribute to the Wire song "Outdoor Miner" — A Houseguest's Wish: Translations of Wire's 'Outdoor Miner'. ADAM FRANKLIN was the singer and main force behind the legendary Oxford/London quartet Swervedriver who released four albums in the 1990s. Swervedriver had perhaps the most identifiable sound of all the noise-pop / shoegaze bands to emerge from the UK during this era  owing in large part to Franklin's unusual, casual vocal style. Franklin's post-Swervedriver work was released under the name Toshack Highway  songs that showcased more experimental and acoustic-driven material. TITANIA (Resplendent Records) is multi-instrumentalist Michael Turner and vocalist Mandy Cousins who hail from Edmonton, Alberta. Turner's remarkable guitarwork in Titania and his instrumental project Angelmark suggests the legendary Robert Fripp, Vini Reilly, and Maurice Deebank, while Cousin's vocal delivery recalls the preeminent female singers of 4AD Records (Liz Fraser, Lisa Gerrard). Titania's spritely version of "Outdoor Miner" brings to mind the duo's pop-oriented debut album Boon (1992), recorded when they were known as The Sensualists. KICK ON THE FLOODS is the new project by For Stars singer Carlos Forster and Mike Funk. For Stars recorded four albums for Future Farmer Records from 1998-2004, each signified by Forster's moody, poetic songwriting. "Outdoor Miner" is the first offering by Kick On The Floods, and Forster's Beach Boys-esque vocal layers reveal a lighter, brighter side to this San Francisco, California artist. TIMONIUM (Pehr Records) is comprised of singer/guitarist Adam Hervey, drummer Adam Garcia, bassist Tracy Uba, and studio guitarist James Rawson. The band is renowned for painting chilly, dynamic pieces that flirt with slo-core, dream pop, and post-rock. The band toured the U.S. in both 2003 and 2004 and their intense live performances are magnified by Garcia's wildly popular and enthusiastic drumming style. POLAR (Jabalina Musica) was formed in Valencia, Spain in 1994 by Jesús de Santos (guitar, vocals), Miguel Matallín (guitar, vocals), Paco Grande (bass) and Jesús Sáez (drums) and have released three albums and five EPs of intimate, nuanced pop over the last decade. Polar was named the best live band in Spain by the prominent Mondo Sonorro magazine and have performed at many of Spain's leading festivals. TYPEWRITER is the new musical project from The Lucy Show frontman Mark Bandola. The Lucy Show was one of the essential post punk bands to emerge from the United Kingdom in the early 1980s. Suggesting the melodic hooks of New Order, the dark colorings of The Cure, and the psychedelic feedback of Jesus & Mary Chain, The Lucy Show released two remarkable albums, ...Undone (1985) and Mania (1986). The Lucy Show toured the United States several times, including tours with R.E.M. and The Cocteau Twins. Bandola released the first Typewriter album in 2002 — a diverse collection of musical styles, lovely stitched together by his inventive songwriting and unmistakable voice. FIEL GARVIE (Words On Music) is an art-pop quintet from Norwich, England formed in 1996 by Anne (vocals, guitars, keys), Adam (guitars, keys), Jude (bass), and Greg (drums). Fiel Garvie released three EPs and one album before Emma (keys, vocals) joined the band in 2002. In 2003 the group saw the release of their Leave Me Out Of This album on Words On Music. EXPERIMENTAL AIRCRAFT (Rollerderby Records) was founded by Rachel Staggs and TJ O'Leary in Austin, Texas in 1997. The band recorded albums for Devil In The Woods (2000) and Staggs' own Rollerderby Records (2002), each replete with dreamy, space-rock soundscapes. ABOVE THE ORANGE TREES (Mudita Records) is fronted by California singer and guitarist Jeff Pitcher who has released a half dozen albums since the late 1990s. Together with Kristina Forester (cello, piano, vocals), Ron Guensche (bass) and Rich Douthit (drums) above the orange trees injects just the right amount of the poetic, the melancholic, and the anthemic into their songs. CHRISTIAN KIEFER (Extreme Records) is a singer-songwriter and author from the gold-rush country of Rocklin, California. Kiefer's music is difficult to classify  his albums are infused with folk, blues, newgrass, and alt-country elements  all bound together by powerful narratives reflecting the old west whose history surrounds him. Kiefer has collaborated with many musicians including Joan Jeanrenaud from Kronos Quartet and Jason Sinclair Long of Blue Man Group. BOY DIVISION is a cover-band from Hamburg, Germany known for their aggressive abbreviated punk renderings of popular songs. Ollie's megaphone-induced vocals have led Boy Division's interpretation of The Eurythmics ("Sweet Dreams Are Made of This"), Chris Isaak ("Wicked Game"), R.E.M. ("Losing My Religion"), New Order ("Blue Monday"), and Morrissey ("Everyday Is Like Sunday"). Their translation of "Outdoor Miner" is a quick reminder of Wire's own punk roots. THE MEETING PLACES (Words On Music) formed in Los Angeles, California in 2001 by Arthur Chan (bass), Chase Harris (vocals & guitar), Scott McDonald (guitar), and Dean Yoshihara (drums). Their debut album Find Yourself Along The Way (recorded by Earlimart's Aaron Espinoza) is regarded as a modern dream pop classic, with McDonald's signature reverberating washes serving as a foundation for the pop sensibilities contributed by Harris, Chan, and Yoshihara. The Meeting Places perform frequently in California and have also played the South By Southwest and Noise-Pop festivals. LAURA WATLING (Shelflife Records) has lent her delicious voice and musical talents (on guitar, bass, keyboards, drums) to several projects in the California Bay Area since the late 1990s including the Autocollants, Casino Ashtrays, and currently The Disappointment (as well as writing her own solo records). As Parker Posey was appropriately dubbed the queen of indie films, Laura Watling is rightly regarded as the west coast queen of indie pop. JUNETILE (Ocean Music) are from Ontario, Canada and were founded in the mid-1990s by Jon athan Relph (vocals, guitar) and Sam Simmons (vocals, cello, guitar) with Chris Stringer (keyboards, bass) joining a few years later. Their debut album is a highly textured blend of organic and electronic instrumentation. Junetile's version of "Outdoor Miner" alternates between a noise-induced verse and a haunting, hymnal chorus that serves as a befitting bookend to the tribute album.